Slowly but surely, whether or not you approve, it is happening: a theocratic United States is swiftly becoming a reality. The legality of so many abhorrent practices in our society are due to the occasional but monumentally wicked and iniquitous Supreme Court decision. What’s so appalling is this case in particular rivals Dred Scott and Citizens United and the decision went quietly under the radar as that year was not remembered for much other than the September 11th attacks. Originally heard on February 2001, SCOTUS rendered its decision on June 11, 2001 regarding the prohibition of religious clubs meeting on public school grounds. In the case The Good News Club v Milford Central School, the Supreme Court ruled in favor of the plaintiff 6-3 that the Child Evangelism Fellowship Organization had the freedom of speech right to set up evangelical clubs in public elementary schools. Separating Church and State, basically over a technicality, had been effectively nullified. The curriculum of The Good News Club is standardized to indoctrinate children. 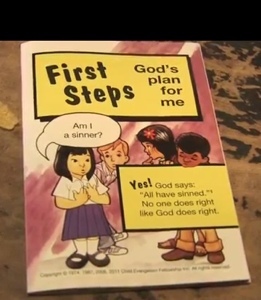 The strategy is based on the premise that what a child learns at school must be true, so a teacher instructing a class on mathematics and next class the same children are told “they are born sinners and must repent to the gospel of Jesus Christ” as if they are factual equivalents. The universally taught text of the Good News Club (GNC) has over 5,000 references to sin, 1,000 references to obedience, 1,000 references to punishment and more allusions to hell than Boticelli’s rendition of Dante’s terrifying underworld. This is accomplished through books that, for those unable to yet read, are furnished with pictures to indoctrinate as young as possible. The Biblical tale of Saul and the Amalekites is used as an example of the compulsory obedience to “God’s decrees” no matter how outlandish or horrific they may be. Many have used this story from Deuteronomy 29:16-18 (as well as other mentions of Saul throughout the Old Testament) to justify committing genocide based on a book of fiction. A sin is a sin, so they equate this mass slaughter with a “sin” such as failing to clean one’s room. The most essential quality of the GNC is absolute obedience and compliance. Even the smallest of sins require complete obedience to their interpretation of the gospel and some children literally terrify their disbelieving peers with tales of fire and brimstone. The shocking video below shows the lengths these fundamentalists will go to convert and brainwash children. I liken it to a child predator offering treats from a fake ice cream truck to lure children for far more insidious intentions. It has been well established that indoctrination into any belief system occurs largely during primary school years. The Supreme Court’s majority opinion was based on the rejection of the argument that young children are particularly vulnerable to mistaking equal access for official endorsement and the rules should thus be different for elementary school. The dissenting opinion by Justice Stevens seems to be the most thought provoking as he believes this will (and already has) erode(d) the separation of church and state. With the premise that free speech can also include politically motivated clubs like the KKK, there’s no limit to what is tolerable at public elementary schools if one subscribes to the case’s majority rule author, Clarence Thomas (and the five other Conservatives on the Bench). The Establishment Clause of the First Amendment has been eviscerated. Justice Stevens separated the “religious purposes” mentioned in his policy statement into three possible types of religious speech. He stipulates that 1. some religious speech is “simply speech about a particular topic” 2. Implications of Good News (Club’s agenda) from a religious point of view that some religious speech amounts to worship “or its equivalent” and 3. that some religious speech proselytizes by nature or inculcates belief in a particular faith, while the First Amendment potentially protects all of these forms of speech against action by the state. Stevens compares the Good News Club and its proselytizing meetings to a political organization trying to recruit members. He concludes that Milford may exclude these kinds of meetings because “such recruiting meetings may introduce divisiveness and tend to separate young children into cliques that undermine the schools’ educational mission.” Justices Souter and Ginsberg agreed with Stevens as they all, justifiably, felt this case clearly violated the separation of church and state. If there’s any question of where this is coming from, those interviewed in the documentary happily admitted they learned of these Spectaculars for Christ at Chik-Fil-A and McDonalds to name a few. Corporate America is very interested in maintaining a population that is pliable and easily hooked on believing what they are told while ignoring harmful consequences caused by their right-wing, anti-labor and pro-pollution policies. Using Christian theology masked as factual curriculum on the children of our public schools is a fantastic way to keep the sheep buying in to their mantra. While they cry out about some imagined threats to the Second Amendment as the evisceration of our Constitution, they are effectively eroding the most precious freedoms of the First Amendment. Nobody seems to notice. The media has not deemed this a problem because the media has been deregulated to reflect corporate America’s will as absolute fact. These are very scary times for America indeed. As Susan Rice is settling in to her National Security Advisor position, I am reminded of the stark disparity of respect the NSA Bush appointee received versus President Obama’s chosen advisor. When Condoleezza Rice held this coveted, powerful position from 2001-2005, the white president Bush 43 received virtually no opposition, outrage or controversy vis a vis Ms. Rice. Incidentally, Condi was the NSA while the worst terrorist attack on American soil occurred. As a pivotal player in the Bush Crime Family, she too is guilty of war crimes which include sanctioning torture. 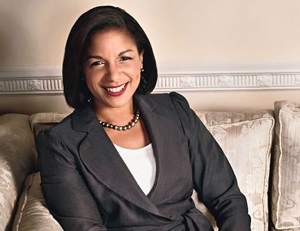 If anyone earned a fair amount of scorn, it’s Condi Rice. However, the GOP views her as a hero, begging and pleading her to run for the White House. As a Black Republican, she joins the likes of self-loathing African-Americans whose policies stab their fellow countrymen in the back while acting as puppets to the White Republican majority in the party. In fact, a movie critic of Django Unchained likened the villainous character played by Samuel L. Jackson to SCOTUS Justice Clarence Thomas. Up until the early 1960’s, African Americans, including MLK aligned themselves with the GOP because the Dixiecrats, A.K.A. Southern Democrats adopted a states’ rights segregationist platform. We all know what they became: the current racist, sexist crazies of the GOP, feebly attempting to court voters by relying on fear, religion and shameless gerrymandering to grasp at the last straws of power in a losing demographic shift against the GOP. Since the onset of the Obama Presidency, any prominent African American has received an unprecedented amount of criticism and scrutiny, so much so as to force several competent appointees to retire from service. The Right Wing pounced all over the Benghazi Consulate attacks as a massive scandal of Herculean proportions, pinning blame on then Ambassador Susan Rice who simply delivered the briefing she received from the CIA. Her alleged omission of the term terrorist attack put Senator Lindsey Graham (and his troika, McCain and Ayotte) right on his fainting couch with a bad case of the vapors. Then Secretary of State Clinton testified masterfully and put these frivolous claims to rest, but Ambassador Rice had to withdraw her name from consideration to replace the outgoing Mrs. Clinton as her successor. Fortunately, President Obama had the last laugh as the NSA position perhaps wields more power than the Secretary of State. The NSA position, incidentally, required no Congressional approval. African American Attorney General Eric Holder, as recently as last week was urged to resign by both Democrats like Senator Manchin of West Virginia and Republican loudmouth Peter King of New York. So what’s the reason for such a devastatingly contemptuous suggestion? Have we ever seen an Attorney General so maligned as Eric Holder? We’ve seen desperate attempts at creating fake scandals such as the IRS brouhaha over scrutinization of Teabaggers who certainly deserved dissection over their social welfare tax-exempt status. As recently as June 11, Texas Representative Ted Poe called the NSA’s surveillance issue government spooks drunk on power, both deriding blacks with a not-so-thinly-veiled attempt at overt racism while simultaneously suddenly finding fault with a program they overwhelmingly supported under GWB, aka Bush 43. Never before has a whistleblower (Snowden) who intentionally leaked classified info been given a pass as some patriot while behaving like a self-aggrandizing media whore who relies on the shady likes of Glenn Greenwald to lend credibility to his nothing to see here proclamations. We’ve known this has been going on since 9-11-2001, so this revelation is nothing more than a cheap stunt to get Greenwald the attention he so craves. As far as the Right Wing Media is concerned, all this surveillance was just fine and dandy back in 2006. However, notice an almost bipolar attitude change from Fox News’ always inflammatory Sean Hannity. The Supreme Court is ruling on Section 5 of The Voting Rights Act of 1965 and it is widely known that Chief Justice John Roberts has been itching to dismantle this protection for racially discriminated, poorer minorities in areas having an ugly history of past violations of ethical voting practices. States like Texas, Alabama and Mississippi are prominently featured in this category. Ever since Roberts was a clerk for then President Reagan in 1982, he has worked to remove this statute of the 14th Amendment. If Chief Justice Roberts has his way, the country will take one giant step backwards in the direction of racist Teabaggers who will disenfranchise those who dare to vote while being Black or a minority in Republican strongholds. Stay tuned for the decision on Monday, June 17. Actually, it looks like we’ll be waiting until the last possible day before SCOTUS goes on recess. This just makes anyone interested in equal rights a bit more on edge. UPDATE: 6/25/2013. Section 4 is officially gone. Chalk up a victory for racism to flourish in the South. No check on questionable election practices now.